If you really want to know why anyone would want to climb a mountain like Mt. Everest, you won’t find the answer in the film “Everest.” The answer is probably found in many of the other mountain climbing-related texts whether it’d be the documentary “Touching the Void,” the IMAX doc “Everest,” or Jon Krakauer’s best-seller “Into Thin Air” which tells the same story as 2015’s “Everest” (though the film isn’t technically based on the book). But as with most narrative films if you strive to actually learn about a real life incident, you’re better off reading the book or at least the Wikipedia page. That’s not to say that “Everest” isn’t a well-made film; it features terrific performances and some truly suspenseful sequences. It works as a docuthriller, but there’s just something missing. I missed the emotional connection with the characters who are almost as thin as the air to which they ascend. The film stars Jason Clarke as Rob Hall a New Zealander who leads a tourist group called Adventure Consultants. This group trains and guides those willing to spend the money to summit Mt. Everest. All 29, 029 feet of it. 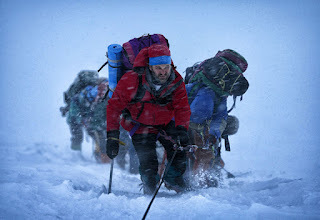 The film is set in 1996 and some familiar faces round out the cast of real life climbers who wish to scale the mountain. There’s Josh Brolin as Beck and John Hawkes as Doug. Michael Kelly plays writer John Krakauer who is also part of the expedition. There is one female climber played by Naoko Mori, but otherwise most of the female roles are rather passive. We’re talking about Keira Knightly as Rob’s pregnant wife at home, and Robin Wright as Beck’s wife at home. Jake Gyllenhaal shows up as well as a guide in another group who are planning to scale the mountain at the same time. This sort of causes complications. As anyone who would have the nerve to climb the world’s tallest mountain, there’s a lot of testosterone fueled rivalry going on which will eventually lead to tragedy. Oh, and the fact that mother nature can be extremely brutal when she wants to be. The film’s first have, as directed by Bathasar Kormakur, is fairly straightforward in terms of narrative. There’s nothing truly flashy about the camerawork or editing. The film feels more like a documentary which makes sense, while the film’s second half skews into disaster movie mode after a freak snow storm causes trouble for those still up on the mountain. For all of the setup leading to the inevitable disaster that eventually occurs William Nicholson and Simon Beaufoy’s script doesn’t manage to flesh out the characters all that much which is sad because Beaufoy is responsible to some truly great scripts including the outstanding “127 Hours” (My guess is that he was brought in just for rewrites). That’s not to take anything away from the spectacle that is “Everest.” It’s certainly a sight to behold and it very intense and suspenseful. The film might rely just slightly too much on CGI shots of the mountain which take away from the nauseating height – which might actually be a good thing. Trailer for Everest on TrailerAddict.